When Is a Good Time to Part Prepay a Home Loan? I have been paying EMI for 5 years but the principal outstanding has hardly changed. Why? This is one question that has puzzled many of us. The answer lies in understanding how loan calculations work. Most loans are Reducing Balance loans (instead of flat interest rate loans). To understand the difference between the two methods, suggest you go through the following post. In this post, I will focus on Reducing Balance loans and will explain calculations behind this method. How Reducing Balance Method Works? Under the reducing balance method, a portion of your EMI goes towards interest payment while the remaining portion goes towards principal repayment. Let’s try to understand with the help of an example. Suppose you have taken a loan of Rs 50 lacs for 20 years. Let’s further assume that the rate of interest stays constant at 10% p.a. EMI for the loan is Rs 48,251. You can easily find the EMI amount 1) using our EMI Calculator, 2) by doing simple mathematical calculations or 3) using PMT function in excel. Let’s go back to interest and principal calculations. If you want to see how your repayment schedule will appear on yearly basis, let’s have a look (shown below with January 2018 start). With each EMI, interest portion of the EMI goes down while the principal portion goes up. In the first month, you paid Rs 41,667 towards interest and Rs 6,584 towards principal. In the second month, Rs 41,612 went towards interest payment while Rs 6,639 went towards principal repayment.What Does This Tell You? Why does this happen? This happens because principal outstanding goes down with each EMI. For instance, principal outstanding goes down to Rs 49.93 after first EMI payment. After second EMI payment, it goes down to Rs 49.87 lacs. As we have seen earlier, interest component of the EMI is a product of Principal Outstanding and monthly interest rate. As principal outstanding goes down with each EMI, interest component of the next EMI will also go down. And as the interest component of the EMI goes down, principal component of the EMI will go up. During the earlier part of your loan tenure, a greater portion goes towards interest payment. Towards the end of the repayment schedule, a greater portion of the EMI goes towards principal repayment. 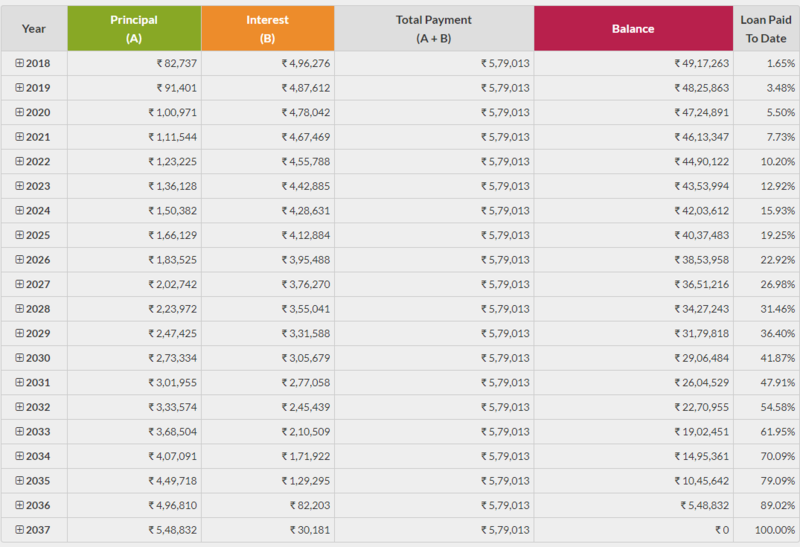 You can see that even after 5 years (first 60 months) of repayment, you have repaid only 10.2% of the loan amount. In the next years (between 61st and 120th month), you will repay a further 16.78% of the principal amount back. Between 121st and 180th month, you will repay 27.61% of the principal amount back. During the last 60 months (181st and 240th month), you will repay 45.42% of the principal amount back. You can see that during the first five years, you will repay only 10.2% of the principal back i.e. Rs 5.1 lacs. During the last five years, you repaid 45.42% of the principal back i.e. Rs 22.71 lacs. If you were wondering why your loan outstanding has not moved much despite many years of timely EMI payments, you have your answer. The pace of principal repayment increases only during the later period of your repayment schedule. How Will Interest Rate Movements Affect You? When interest rate changes, you will have two options. (2) is typically the default option. Let’s assume interest rate is cut. Let’s see how it will impact your repayment schedule. Clearly, if the annual interest rate goes down, monthly interest rate will also go down. If the monthly interest rate goes down, interest component of the EMI goes down and the principal component goes up. As the principal component goes up, the loan gets repaid faster, effectively resulting in reduction in loan tenure. In the above example, let’s assume the loan interest rate was cut to 9% at the end of 60th month. In this case, the loan will get repaid in 221 months (60 months already paid and 161 additional months). You will end up saving about 19 EMIs. Alternatively, if your loan interest rate was hiked, a greater portion of the EMI will go towards interest payment and a lesser portion will be left for principal repayment. This will effectively increase your loan tenure. In the above example, let’s assume the loan interest rate was hiked to 11% at the end of 60th month. In this case, the loan will get repaid in 267 months (60 months already paid and 207 additional months). You will end up paying an additional 27 EMIs. How Does Prepayment Affect You? Clearly, prepayment reduces the principal outstanding. As principal outstanding goes down, interest component of the EMI goes down. That increases the principal component of EMI. Therefore, loan gets repaid even faster. In the above example, let’s assume you made the pre-payment of Rs 5 lacs at the end of 60th month, the loan will get repaid in 201 months (instead of 240 as per the original schedule). The calculations are with you. If you want to understand how interest rate changes and prepayments affect your pocket, you can rely on our Home Loan EMI Calculator or these basic spreadsheet calculations to assess the impact.